The 3 Series is one of the best driver oriented cars in its class today. Over the years the car has grown to become more comfortable and spacious too. Some loved the older generation model's footprint for its agility and power, but in growing markets like Asia, one demanded more comfort and a sporty character too. That's why the current model is much larger than the previous car. But what about those looking for more practicality in a car and with similar dynamics as the 3 sedan? So BMW makes the 3 Series Touring for them. However, the Indian market has never been open to station wagons, and not just here but there are many car markets around the world that don't seem to like this particular bodystyle. 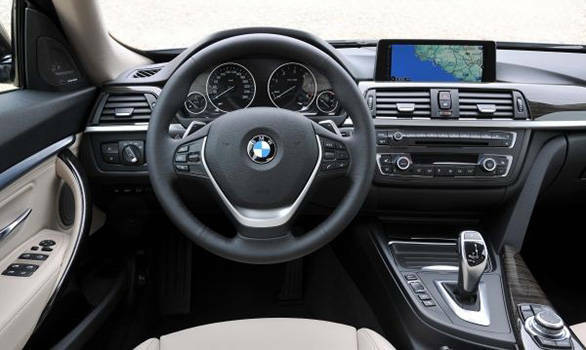 This very reason led designers at BMW to create the 3 Series Gran Turismo, a car that claims to combine the driving dynamics of a 3 Sedan with more practicality and space than the 3 Series Touring. The car is heading to India very soon so we headed to Spain to check out the latest member from the BMW 3 family. Look at it head-on, and one can mistake the car for a 3 Series sedan, but on a second look the increase in height is evident. The car stands taller, since it is almost 80mm higher than the sedan. It retains the sporty face that defines the 3, it gets similar sleek headlamps that merge into the kidney grille but are slightly larger. The front bumper is a new design, and depending on the variant, receives different detailing. And just like the sedan, the bumper also houses the air curtain to improve aerodynamics. Move to the side and the first thing that one will notice is the car's sheer length. It is 200mm longer than the 3 Series we are used to seeing in India making it the longest 3 Series there is, even the wheelbase has grown by 110mm. The car's silhouette and form reminds one of the larger 5 Series GT. The front overhang is short and the coupe-like sloping roofline is prominent. The front fender houses the air breather which not just improves aerodynamics but also adds character to the side, while the glass area is also large thanks to the quarter window. The GT uses frameless doors giving the car a premium look. The stubby rear end and long overhang is also very similar to the 5 GT but less bulky. The LED taillights are large and look much slimmer when lit while the rear even gets the same GT badging. For the first time in a BMW, an active rear spoiler has also been included, it pops up at speeds over 110kmph and helps reduce lift at higher speeds. If needed, one can even open and close it by just pushing a button while driving or when parked. And when closed, one can't tell that the car actually features a rear spoiler. Internationally, the 3 GT is offered with 17-inch wheels as standard but the India spec car will run on 18-inchers. Ground clearance is impressive making it ideal for India and is further improved due to a slightly higher profile tyre, however like all BMWs, the GT will also feature run flat tyres. Overall, it is a better looking car in flesh than the 5 Series GT and it is sized and proportioned well, it is a design that won't impress you as much as other BMW cars but it will eventually grow on you. But the GT was developed to combine the sportiness of the 3 sedan and the practicality of a tourer, and it shows when you step inside. The 3 Series has grown in size and as a result, offers more room and better comfort. The GT, however, is even more spacious. The interior designers worked hard to liberate as much space and make use of the additional length. In fact the increase in rear knee room by 70mm over the sedan makes it even more spacious than a 5 Series! Head room is also more and the wide seats make it a very comfortable place to be in. The large greenhouse and higher seat height gives the driver and passengers a commanding view. The boot for instance offers a phenomenal 520-litre space, and with the seats folded, the storage space goes up to 1600-litre. Even the loading bay is wide and since the tailgate opens like a hatch, loading large objects is possible. Also, to highlight the practical side of the car, the load area can be utilised in various ways thanks to features such as lashing points, hooks and underfloor storage. We liked the fact that the two-piece parcel tray can be neatly placed under the floor, so when carrying lot of cargo, one doesn't need to worry about leaving the tray at home or make space elsewhere for it in the car. And since it is a luxury tourer, the seats fold automatically by releasing two levers while the tailgate can be opened and closed by just pressing a button. As an option, the boot can also be opened by the movement of the foot under the rear bumper. The driver-focused dashboard uses the same theme as the sedan while the materials and fit and finish are also very similar. And depending on the trim, one can choose between an all black or dual tone interior with either aluminium or wooden inserts respectively. In terms of handling, we were impressed with the Gran Tursimo considering the vehicle has grown longer, taller and as a result is heavier too. BMW engineers have done a good job in tuning the suspension, especially in terms if dynamics. Except for the feeling of sitting slightly higher, the GT doesn't lose out a lot when compared to the dynamic 3 sedan. Body roll is controlled while the suspension itself feels a lot stiffer. However, since the car is going to be assembled in India, except the GT to become slightly softer. Out test car was shod with 18-inch wheels and even over a few broken roads in Spain, the car rode pretty well. This is good news since, the India spec car is expected to offer a better ride. The electromechanical power steering offers a good balance by offering a light steering at parking speeds and as speeds increase, the steering weighs up perfectly, offering good feedback. Steering response is impressive for a car this size. The EPS also operates only when required and hence helps reduce fuel consumption. 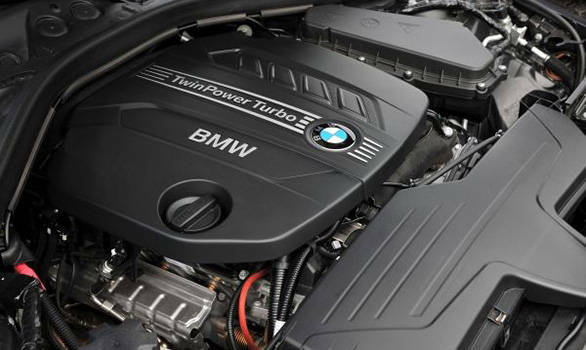 The Gran Turismo was launched internationally with the option to choose from five different engines, three petrol and two diesel options, all featuring BMW TwinPower Turbo technology. 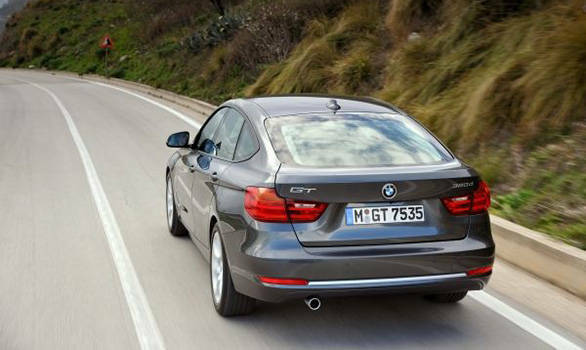 However, since the 3 Series sedan in India is offered with two engine options, the 328i petrol and the 320d diesel, it only makes sense for BMW India to offer the same engines in the 3 GT as well. The 328i engine is probably one of the most exciting petrol units we have seen from BMW, it offers brilliant performance and at the same time good economy. The four-cylinder motor puts out 245PS and 350Nm of torque and is mated to an 8-speed automatic transmission. This helps it cross 100kmph in a claimed 6.1 seconds. Top speed is restricted to 250kmph. 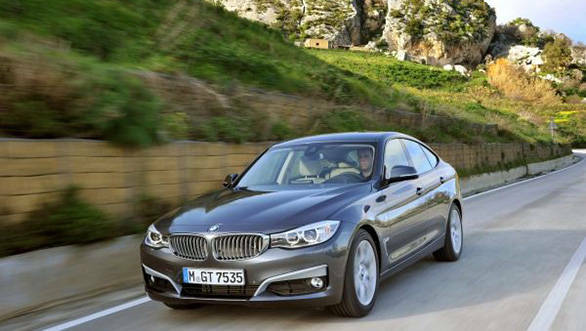 However, it's the diesel 320d that will obviously be more popular when launched in India. We got to exclusively drive the diesel model in Spain. The 2.0-litre common-rail motor produces 184PS at 4000rpm and sufficient 380Nm of torque from as low as 1750rpm. The engine is mated to the same eight-speed torque converter that offers quick and seamless shifts. The engine displays almost no turbo lag and as a result is a pleasure to drive in town and on the highway. Cruising at triple digit speeds is effortless and running costs are low, making the GT an ideal tourer. And it is quite quick off the line too, the claimed 0-100kmph time is 7.9 seconds. The top speed is a good 226kmph, and a claimed overall fuel economy of over 20kmpl is very impressive for a 2.0-litre unit. Engine noise is slightly on the higher side, but inside the car, a lot of insulation and damping helps reduce NVH levels considerably. The 3 Series Gran Turismo will be launched at the Auto Expo and we expect the car to be priced Rs 5 lakh more than the sedan. This will position the car perfectly in between the 3 and the 5 Series sedans. BMW India will want to position the car as a more premium offering rather than just another variant of the 3 Series. For the extra premium, the car offers similar dynamics and at the same time more practicality. The styling will take time getting used to but since it is a mini 5 Series GT at a much lower price, expect quite a few takers. Besides, rear seat comfort and limo like leg room will be one of the car's biggest USP especially in India. The GT will be assembled in India by the end of February and should be out on the road by March.